A spreading colony of asexually reproducing coral polyps provide shelter for a moray eel. Over the eons many corals have evolved with the ability to reproduce both asexually and sexually. In asexual reproduction, new clonal polyps bud off from parent polyps to expand or begin new colonies (Sumich, 1996). This occurs when the parent polyp reaches a certain size and divides. The process continues throughout the animal’s life, forming an ever-expanding colony (Barnes and Hughes, 1999). The nature of sexual reproduction among corals varies by species. About three-quarters of all stony corals form hermaphroditic colonies. These colonies have the ability to produce both male and female gametes. The remainder form gonochoristic colonies which can produce either male or female gametes, but not both. The sexuality of corals—whether hermaphroditic or gonochoristic—tends to be consistent within species and genera, although there are exceptions (Veron, 2000). A male star coral (Montastraea cavernosa) releases sperm into the water column. As a predominantly sessile group of organisms, about three-quarters of all stony corals employ broadcast spawning to distribute their offspring over a broad geographic area. These corals release massive numbers of eggs and sperm into the water column (Veron, 2000). The gametes fuse in the water column to form planktonic larvae (planulae). A moderately-sized colony may produce up to several thousand planulae per year (Barnes and Hughes, 1999). Large numbers of planulae are produced to compensate for the many hazards they inevitably will encounter as they are carried through the water. The time between planulae formation and settlement is a period of exceptionally high mortality among corals (Barnes and Hughes, 1999). In contrast, some coral species brood planulae within their bodies after internal fertilization. While spawning is associated with high numbers of eggs and planulae, brooding results in fewer, larger and better-developed planulae (Veron, 2000). Planulae swim upward toward the light (positive phototaxis) to enter the surface waters and be transported by the current. This behavior is observed not only in nature but in laboratory experiments as well (Jones and Endean, 1973). After floating at the surface for some time, the planulae swim back down to the bottom, where, if conditions are favorable, they will settle and begin a new colony (Barnes and Hughes, 1999). In most species, the larvae settle within two days, although some will swim for up to three weeks, and in one known instance, two months (Jones and Endean, 1973). Once the planulae settle, mortality rates drop steadily as they metamorphose into polyps and form colonies which increase in size. The new colony becomes sexually mature at a minimum size, depending on the species. Some massive species, like Favia doreyensis, reach sexual maturity when polyps grow to about 10 cm in diameter, which occurs when they are about eight years old. However, some faster-growing, branching corals, including species of Acropora, Pocillipora, and Stylophora, reach sexual maturity at a younger age (Barnes and Hughes, 1999). A star coral (Montastraea franksi), releasing egg and sperm bundles, with a feeding brittle star (Ophioderma rubicundum). Among sessile corals, the timing of the mass release of gametes into the water column (broadcast spawning event) is very important because males and females cannot move into reproductive contact. Spawning species must release their gametes into the water simultaneously. Because colonies may be separated by wide distances, this release must be both precisely and broadly synchronized, and is usually done in response to multiple environmental cues (Veron, 2000). The long-term control of spawning (control of the maturation of gonads) may be related to temperature, day length and/or rate of temperature change (either increasing or decreasing). The short-term (getting ready to spawn) control is usually based on lunar cues. The final release, or spawn, is usually based on the time of sunset. Cues also may be biological (involving chemical messengers) or physical (Veron, 2000). Brooding species can store unfertilized eggs for weeks, and thus, require less synchrony for fertilization. Spawning species require synchrony within a time frame of hours (Veron, 2000). This regional synchrony varies geographically. In Australia’s Great Barrier Reef, more than 100 of the 400 plus species of corals spawn simultaneously within a few nights during spring or early summer (Willis, B.L. et al., 1997). Studies have shown that coral species can form hybrids through mass spawning (Hatta et al., 1999). Such observations have led to the theory of reticulate evolution (Veron, 1995) whereas modern coral species came about not through the separation of new species along different lineages, but rather through a continual process of separation and fusion. In western Australia and the Flower Garden Banks of the northern Gulf of Mexico, spawning occurs in late summer or fall (Levinton, 1995), and not necessarily simultaneously. In the northern Red Sea, none of the major coral species reproduce at the same time. 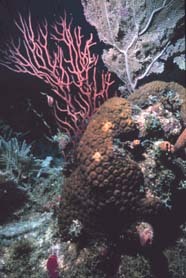 In addition, individual corals do not necessarily breed every year (Sumich, 1996). Evidence indicates that slow-growing, longer-lived corals are less likely to spawn every year than faster-growing, shorter-lived species (Barnes and Hughes, 1999). The unique mutualism between hermatypic corals and their photosynthetic zooxanthellae is the driving force behind the settlement, growth and productivity of coral reefs (Levinton, 1995). Zooxanthellae are photosynthetic, single-celled dinoflagellates, living in the endodermal tissues of stony corals polyps (intracellularly). Often, zooxanthellae are concentrated in the polyps’ gastrodermal cells and tentacles (Levinton, 1995). Deep water and some cold water corals lack zooxanthellae, but virtually all reef-building corals possess them (Lalli and Parsons, 1995). 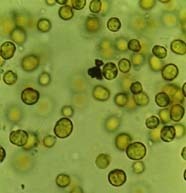 During photosynthesis, zooxanthellae “fix” large amounts of carbon, part of which they pass on to their host polyp. This carbon is largely in the form of glycerol but also includes glucose and alanine. These chemical products are used by the polyp for its metabolic functions or as building blocks in the manufacture of proteins, fats and carbohydrates. The symbiotic algae also enhance the coral’s ability to synthesize calcium carbonate (Lalli and Parsons, 1995). Because of their intimate relationship with zooxanthellae, hermatypic corals respond to the environment in many ways reminiscent of plants. As a result, the distribution and growth of corals is strongly light-dependent, as is the overall growth of the reef (Levinton, 1995). The vertical distribution of living coral reefs is restricted to the depth of light penetration, which is why most coral reefs dwell in shallow waters, ranging to depths of approximately 60 to 70 meters. The number of species of hermatypic corals on a reef declines rapidly in deeper water; the curve closely follows that for light extinction (Barnes, 1987). Because of their dependence on light, reef corals require clear water. Thus, coral reefs generally are found only where the surrounding water contains small amounts of suspended material, i.e., in water of low turbidity and low productivity. Thus, corals prefer waters that are nutrient-poor, yet paradoxically, are among the most productive of marine environments (Barnes, 1987). Coral polyps with extended tentacles feeding on zooplankton. Although the zooxanthellae supply a major part of their energy needs, most corals also require zooplankton prey. With some exceptions, most corals feed at night (Barnes, 1987). When capturing food particles, corals feed in a manner similar to sea anemones. Polyps extend their tentacles to capture prey, first stinging them with toxic nematocyst cells, then drawing them toward their mouths. In addition to capturing zooplankton, many corals also collect fine particles in mucous film or strands, which are drawn by cilia into the polyp's mouth. Some species are entirely mucous suspension feeders, such as the foliaceous (“leafy”) agariciids, which have few or no tentacles. Prey ranges in size from small fish to small zooplankton, depending on the size of the coral polyps (Barnes and Hughes, 1999). Prey supplies the coral and its zooxanthellae with nitrogen, an element essential to both organisms, but one that is not produced in sufficient amounts by either. The symbiotic relationship between corals and zooxanthellae facilitates a tight recycling of nutrients back and forth between the two (Barnes, 1987). The degree to which the coral depends on zooxanthellae is species-specific (Barnes, 1987). Branching corals appear to be more self-nourishing (autotrophic) than some of the massive corals, largely because the multi-layered growth form of branching corals allows for a greater surface area to intercept light both horizontally and vertically. This enables corals to make maximal use of both incident and scattered light. In addition to these skeletal modifications, the polyps of branching corals tend to be small, thereby exposing the maximum area of zooxanthellae to light (Barnes and Hughes, 1999). Corals that must obtain nourishment from outside sources (heterotrophic) typically are spheroidal and have a single-layered skeletal structure (Barnes, 1987). Less plant material exists in the thicker tissues of massive corals as well. Heterotrophic corals possess thicker, larger polyps that allow for the capture of more plankton. Their form also maximizes the surface area of plankton-intercepting tissue (Barnes and Hughes, 1999). Spreading formation of this Acropora sp. maximizes the utilization of sunlight by its zooxanthellae for photosynthesis. The data on the amount of energy that corals derive autotrophically and heterotrophically are uncertain. However, estimates project that the proportion of energy ultimately derived from photosynthesis ranges from over 95% in autotrophic corals to about 50% in the more extreme heterotrophic species (Barnes and Hughes, 1999). Evidence suggests that the phenomenally high productivity found on coral reefs is a complex function of the combination of efficient light capture mechanisms and nutrient recycling, as well as hydrodynamic processes (Hatcher, 1997; Hatcher, 1990). Corals require free substratum for settlement and free space for growth. Stony corals use two basic strategies to compete for space: indirect encounters (overtopping) and direct interactions (aggression) (Genin and Karp, 1994). An overtopping strategy is used most often by fast growing species. For instance, stouter, slower-growing corals are sometimes at a competitive disadvantage when they coexist with branching corals, which, by virtue of their upright, faster growth, gradually overtop their neighbors. The effects of overtopping are indirect. Underlying corals suffer light deficiency and come into contact with fewer food particles (Glynn and Wellington, 1983). Shaded from the necessary light, the overgrown species may die eventually, and recruitment of new colonies may be prevented, leaving a pure stand of branching corals (Barnes and Hughes, 1999). Such a situation was observed on the Great Barrier Reef, where sequential photographs were taken over several years. Branched colonies of Acropora gradually extended over colonies of massive Montipora. When some of the Acropora branches were broken off in a hurricane, the underlying portions of the stouter colonies were dead (Barnes and Hughes, 1999). In some situations, however, the fast, continued growth of branching corals may lead to their own demise. If environmental conditions allow it, branching coral colonies can become overcrowded and die, and eventually are overgrown by another species (Barnes and Hughes, 1999). Corals reach out to their neighbors with long filaments which literally dissolve the coral tissue next door, making room for them to expand their surface area. While fast-growing corals often employ overtopping competitive strategies, other aggressive behaviors often are used by slow-growing species (Lang, 1973; Wellington, 1980; Bak et al., 1982). One type of aggressive behavior involves the use of extruded digestive filaments and sweeper tentacles (Lang and Chornesky, 1990). Typically, an attack by an aggressive coral on a subordinate neighbor will result in the death of some of the subordinate’s polyps (Lang, 1973; Sheppard, 1982). Such behavior, however, also may allow for the coexistence of fast- and slow-growing species. In an experiment conducted on Jamaican coral species in the early 1970s by Judith Lang, two coral species were placed adjacent to each other. The corals extruded digestive filaments orally and through temporary openings in the polyp walls. Usually, one species exhibited more aggression than the other, and its filaments penetrated the adjacent polyp walls of the subordinate species. Within 12 hours, the tissue of the subordinate species in contact with the aggressor’s filaments was completely digested, exposing the underlying skeleton. Though larger subordinate colonies suffered only local loss of tissue, colonies less than 3 cm in diameter perished after the attack (Barnes and Hughes, 1999). Lang’s experiments also revealed that each coral species attacked only certain species, and each was attacked itself by certain other species, suggesting an “aggressive pecking order” among the corals. Results suggested that the slow-growing massive corals belonging to the families Mussidae, Meandrinidae, and Faviidae were the most aggressive species. The fast-growing, branching acroporid corals were intermediately aggressive, and the foliose agariciids, also quick growers, were the least aggressive. Aggressors may attack more than one subordinate at a time, and intermediately aggressive corals may attack a less aggressive coral even while being attacked on another side by a more aggressive coral (Barnes and Hughes, 1999). Thus, it appears that at least on Jamaican reefs, fast- and slow-growing coral species can coexist because the speed at which branching corals grow is balanced by the aggressive nature of massive corals (Barnes and Hughes, 1999). However, such a balanced competitive environment is not universal among reef ecosystems. Monospecific stands of corals do exist, and this may be due to a species being relatively fast growing while also aggressive. Other factors like spatial position, size and biological and physical disturbances also influence the outcomes of competition (Connell and Keough, 1985; Cornell and Karlson, 2000). These local processes, in addition to regional ones, contribute to the formation of species-diverse assemblages or a reef dominated by one or a few species (Cornell and Karlson 2000). The coral reefs off the Pacific coast of Panama illustrate a low species diversity reef and the complex species interactions that can occur. The shallow reefs are dominated by species of fast-growing, branching Pocillopora. Species of the slow-growing, massive Pavona dominate in deeper waters. In the field, the distribution of scars left by tentacle encounters between neighboring corals suggests that Pocillopora is dominant over Pavona. However, in laboratory experiments, Pavona can damage the tissues of Pocillopora within 12 hours of tissue contact (Barnes and Hughes, 1999). Fortunately, long-term experiments have explained the paradox. After placing Pocillopora and Pavona together on the reef, within two days Pavona extends its mesenterial filaments and kills the adjacent tissues of Pocillopora. Pavona then retracts its mesenterial filaments, and algae quickly cover the bare areas of Pocillopora skeleton. One to two months later, tissue regenerates over the bare patches, and the polyps on the peripheral branches of Pocillopora adjacent to Pavona convert some of their feeding tentacles into very elongated “sweeper” tentacles that sway passively in the surge, frequently dragging over the Pavona colony (Barnes and Hughes, 1999). Contact with the sweeper tentacles damages or kills the affected Pavona tissue. The exposed skeleton is rapidly colonized by filamentous algae and later by encrusting coralline algae that prevents further contact between the two corals. The sweeper tentacles of Pocillopora contract and resume their normal feeding function. Gradually, the faster-growing Pocillopora overtops the Pavona (Barnes and Hughes, 1999). It is unclear why Pavona does not retaliate by extending its mesenterial filaments to counteract Pocillopora sweeper tentacles. Some researchers suggest that the sweeper tentacles are more powerful than the mesenterial filaments. Though previously thought to be used only for intercepting zooplankton, sweeper tentacles are structurally similar to the special tentacles of sea anemones that are used for aggression between clones (Barnes and Hughes, 1999). A variety of soft and hard corals compete for substrate and nutrients. In addition to indirect encounters (overtopping) and direct interactions (aggression), the competitive advantage of one stony coral species over another may be affected by natural disturbances. Physical disturbances and predation can remove members of a community’s dominant competitors, thus enhancing species diversity. However, disturbances do not necessarily increase species diversity. For instance, if a predator prefers a subordinate species, competitive exclusion is enhanced (Barnes and Hughes, 1999). Any kind of disturbance that disrupts the process of competitive exclusion, but does not eliminate competitors, will promote coexistence (Barnes and Hughes, 1999). Finally, corals must contend with other competitors like soft corals and algae for reef space. Disturbances such as catastrophic low tides, predation and grazing affect the availability of space. Sea urchins and herbivorous fish prevent algae from monopolizing space. Soft corals can be overtopped by stony corals, but their rapid growth and distastefulness to many predators allow them to rapidly colonize any newly-opened space (Barnes and Hughes, 1999). Bak, R.P.M., R.M. Termat and R. Dekker. 1982. Complexity of coral interactions: Influence of time, location, and epifauna. March Biology. 69: 215 - 222. Barnes, R. 1987. Invertebrate Zoology; Fifth Edition. Orlando, FL: Harcourt Brace Jovanovich, Inc. pp. 149-163. Barnes, R. and R. Hughes. 1999. An Introduction to Marine Ecology; Third Edition. Malden, MA: Blackwell Science, Inc. pp. 117-141. Connell, J.H. and M.J. Keough. 1985. Disturbance and patch dynamics of subtidal marine animals on hard substrata. In: Pickett, S.T.A. and P.S. White (eds. ), the Ecology of Natural Disturbances and Patch Dynamics. pp. 125-151. Cornell, H.V. and Karlson, R.H. 2000. Coral species richness: ecological versus biogeographical influences. Coral Reefs. 19:37-49. Genin, A. and L. Karp. 1994. Effects of Flow on Competitive Superiority in Scleractinian Corals. Limnology and Oceanography. 39(4): 913-924. Glynn, P.W., and G.M. Wellington. 1983. Corals and Coral Reefs of the Galapagos Islands. Univ. California. Hatcher, B.G. 1990. Coral reef primary productivity: a hierarchy of pattern and process. trends in Ecology and Evolution. 5(5):149-155. Hatcher, B.G. 1997. Coral reef ecosystems: how much greater is the whole than the sum of the parts? In: Lessios, H.A., Macintyre, I.G. (eds. ), Proceedings of the 8th International Coral Reef Symposium, Panama, June 24-29, 1996, vol. 1, pp. 43-56. Hatta, M., Fukami, H., Wang, W., Omori, M., Shimoike, K., Hayashibara, T., Ina, Y., Sugiyama, T. 1999. Reproductive and genetic evidence for a reticulate evolutionary theory of mass spawning corals. Molecular Biology and Evolution. 16(11): 1607-1613. Jones, O.A. and R. Endean., eds. 1973. Biology and Geology of Coral Reefs. New York: Harcourt Brace Jovanovich. pp. 205-245. Lalli, C.M., and T. Parsons. 1995. Biological Oceanography: An Introduction. Oxford: Butterworth-Heinemann Ltd. pp. 220-233. Lang, J. 1973. Interspecific Aggression by Scleractinian corals. 2: Why the Race is Not Always to the Swift. Bulletin Marine Sciences. 23: 260-279. Lang, J. and E.A. Chornesky. 1990. Competition Between Scleractinian Reef Corals—A review of mechanisms and effects, pp. 209-257. In Z. Dibinsky (ed. ), Coral Reefs’ Ecosystems of the World. V. 25. New York: Elsevier. Levinton, J. S. 1995. Marine Biology: Function, Biodiversity, Ecology. New York: Oxford University Press, Inc. pp. 306-319. Sheppard, C.R.C. 1982. Unoccupied Substrate in the Central Great Barrier Reef: Role of Coral Interactions. Marine Ecology Progress Series 7: 83-115. Sumich, J. L. 1996. An Introduction to the Biology of Marine Life; Sixth Edition. Dubuque, IA: Wm. C. Brown. pp. 255-269. Veron, JEN. 1995. Corals in space and time: biogeography and evolution of the Scleractinia. Ithica: Comstock, Cornell. 321 pp. Veron, JEN. 2000. Corals of the World. Vol 3. Australia: Australian Institute of Marine Sciences and CRR Qld Pty Ltd.
Wellington, G.M. 1980. Reversal of Digestive Interactions Between Pacific Reef Corals: Mediation by Sweeper Tentacles. Oecologia 47: 340-343. Willis, B.L., Babcock, R.C., Harrison, P.L., Wallace, C.C. 1997. Hybridization and breeding incompatibilities within the mating systems of mass spawning reef corals. In: Lessios, H.A., Macintyre, I.G. (eds. ), Proceedings of the 8th International Coral Reef Symposium, Panama, June 24-29, 1996, vol. 1, pp. 81-90.